Countries have to establish a National Committee on Trade Facilitation (NCTF) in terms of their commitment to implementing the Trade Facilitation Agreement (TFA) that was concluded by the members of the World Trade Organization (WTO). In this article, India explains its NCTF implementation journey and how it has structured its NCTF, all guided by its vision to transform India’s trade ecosystem by reducing the time and cost of doing business. Some countries had already gone ahead and established such committees or similar ones, often with mandates going beyond the requirements of the TFA, prior to ratifying the Agreement. But others still had to establish one. India is one such country, establishing its NCTF on 11 August 2016, soon after ratifying the TFA. India committed to applying portions of the TFA from the date it took effect, reporting these provisions under “Category A,” and has listed a number of provisions under “Category B,” meaning that it will implement them after a transitional period following the entry into force of the TFA. But the country does not intend to limit itself to the implementation of the TFA. It is pursuing a broader trade facilitation agenda that exceeds the TFA’s requirements. While working on the NCTF constitution and the definition of its terms of reference, India took into account the “three P” approach adopted by the WCO when it comes to reform and modernization, wherein political will, partnerships and people play a crucial role in the successful working of an NCTF. Public and private “ownership,” which encourages stakeholder buy-in. Guided by its five working principles, India established an NCTF with a three tier structure consisting of the NCTF (tier 1), a Steering Committee (tier 2) and Working Groups (tier 3), to meet its needs and take its broader trade facilitation agenda forward. All stakeholders have a seat on the NCTF. It is the policy making body that ensures all projects adopted by the NCTF receive political support. The NCTF is chaired by the Cabinet Secretary, the Government’s most senior civil servant and the head of the civil service. Among government representatives are the “Secretaries” (administrative heads) of all key departments involved in trade issues such as Revenue, Commerce, Agriculture, Home Affairs, Shipping, Health, the Chairman of the Central Board of Excise and Customs, the Chairman of the Railway Board, and the Director General of Foreign Trade. Private sector delegates include representatives from major trade associations such as the Confederation of Indian Industries, the Federation of Indian Chambers of Commerce and Industry, and the Federation of Indian Exporters Organization. The total membership of the NCTF stands at 22 and it can co-opt any government representatives on relevant issues as it goes about its work monitoring TFA implementation progress, ensuring actions are coordinated, and, when required, proposing corrective measures based on internal deliberations and feedback received through various outreach programmes. The technical provisions of the TFA – in particular, Section I (Articles 1 to 12) – are substantially Customs-related, with 98% of the provisions fully or partially to be implemented by Customs, placing it at the centre of national implementation efforts. Consequently, Customs has a prominent role to play in the NCTF, where it can share its vast experience in interacting with multiple government and business stakeholders, including promoting coordinated border management (CBM), inter-agency cooperation, and Customsbusiness partnerships. The Secretariat of the NCTF is housed at Indian Customs’ headquarters, and the National Committee is also responsible for monitoring the work of the Steering Committee (tier 2) and the activities of the Working Groups (tier 3). The Steering Committee is made up of a core group of 16 public and private representatives. Together, they compile the action plan, monitor its implementation, and report the results to the NCTF to which they can turn to when seeking guidance. They also undertake gap analyses to assess the degree of compliance of concerned departments and agencies with regard to the implementation of each provision of the TFA. 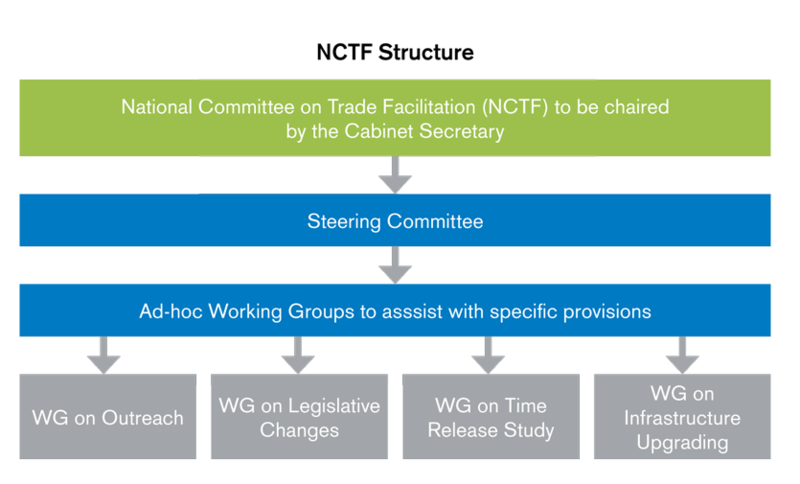 The Committee identifies the nature of change required for achieving full compliance with the TFA, and keeps a watch on the estimated time required to carry out the changes. It receives periodic inputs from all concerned departments and agencies, deliberates on them, and accordingly provides the NCTF with recommendations. The Working Group on Outreach, which organizes sensitization work shops a nd i n for mat ion campaigns that target Customs officers at all levels as well as other partner government agencies and various stakeholders in the supply chain. Some of its activities have been organized in collaboration with international organizations like the World Bank. The Working Group on Legislative Changes, which conducts gap analyses and develops concrete proposals for changes to primary legislation as well as to procedural instructions. It has already done extensive work in identif ying gaps in all relevant acts, rules and procedures, and recommended appropriate changes. The Working Group on Time Release Study (TRS), which aims to identify bottlenecks, take steps to reduce dwell times, and measure and publish the average release time of goods. A TRS is being undertaken for both import and export cargo at all ports, air cargo complexes, inland container depots and land Customs stations in a time-bound manner, with a view to fixing welldefined timelines for each involved stakeholder. The Working Group on Infrastructure Upgrading, which looks at the needs pertaining to infrastructure expansion and renewal at land borders, sea ports and airports, as well as the rail network. A first analysis of the needs of major ports has already been done, and areas which require immediate action have been identified. Two meetings of the NCTF and three meetings of the Steering Committee have taken place so far. Policy directions were given, various initiatives were monitored and, most importantly, coordination among all players in the supply chain was achieved. The NCTF has drawn up a National Trade Facilitation Action Plan (2017- 2020), which was released by India’s Hon. Minister of Finance on 20 July 2017. It is a road map that aims to facilitate trade by transforming the crossborder clearance ecosystem through efficient, transparent, digital, and technology driven procedures, which are supported by state-of-the-art sea ports, airports, rail, road and other logistics infrastructure. The Plan was conceived after considering recommendations from the Working Groups as well as inputs from the private sector. The Action Plan lists 76 goals divided according to the timeframe associated with their development (short term, medium term and long term), and identifies the lead agency responsible for delivering each of those goals. Activities in the Plan have been mapped with TFA articles. Some refer to TFA articles that India notified under “Category A,” i.e., provisions that India would have already implemented by the time the TFA entered into force. The idea here was to improve existing procedures and mechanisms related to those “Category A” standards. The deployment of a direct port delivery (DPD) scheme that allows impor ters/consignees to ta ke delivery of containers directly from port terminals and haul them to factories without first having to take them to container freight stations. India’s vision is to transform the trade ecosystem by reducing the time and cost of doing business. Traditionally, government bodies in the country are seen as regulators, but now the need at the moment is for them to act as facilitators. Meaningful engagement with the private sector, and a structured and comprehensive approach to trade facilitation is being adopted to realize India’s vision.